VOLLEY: BUY & SELL WITH AR- GET RID OF THE CLUTTER IN YOUR HOME! Are you looking to get rid of some of the clutter or unused items in your home? Or do you want to buy necessary items for yourself from some nearby online stores? If the answer is yes, why not you make some money for these old items and buy new goods within a few simple steps using your SmartPhone? You know that a man’s trash is another man’s treasure, so there are millions of apps available right now that make selling and buying items a breeze. One of them is “Volley”, an app which makes buying and selling effortless. Volley allows the users to buy and sell a wide variety of new, used and handmade items, from clothing and accessories to electronic gadgets. Volley has become a mobile shopping sensation, and has been launched this year and has been developed by the Manifold Technology, Inc. Volley requires iOS 11.0 or any later version of the Operating System and is compatible with the iPhone, iPod or iPod touch. 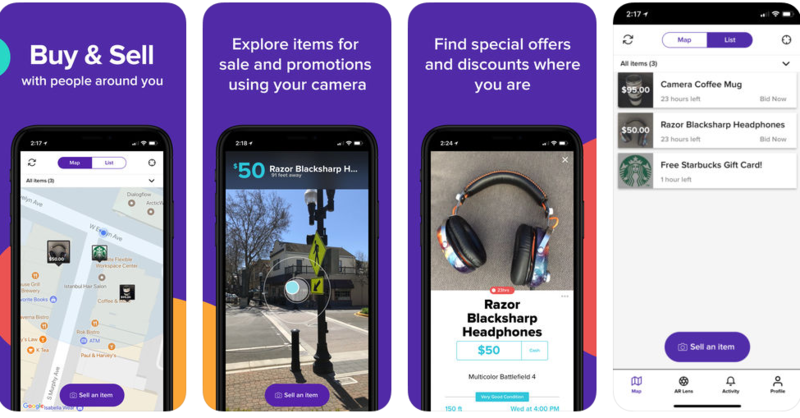 This app is designed to let users buy and sell the stuff in the local area, including electronics, clothing, sports, books, home and many more items. Users can SignUp and Login as a merchant and can display the items they want to sell. In order to create a list of items, use your camera and click the photo of the items you want to sell. Write a short description about the product such as color, size, price, brand, offers, etc. Finally, when someone order the products you offered, you can receive money from your sales via bank deposit, debit card, etc. and send them. With Volley, you can browse the nearby stores and see what’s for sale around you. Sometimes there are unused items in your home with the tags still on when you don’t need them anymore, you can sell them on the app. From laptops, phones and tablets to movie and sports tickets, etc. Volley can help you get some cash for those items. The best part is that the app will do all the work for you! Users can see the approximate distance from where the item was posted, so buyers can see how far it is from their town. Overall, Volley is a great app for buying and selling items and it’s hassle free. So you can sell off the extra goods in your home and earn cash! Moreover, buy the items which are hard and inconvenient to find. Volley is a safe and a convenient app to use. The user verification and safety features are built in to eliminate scams. From the users review and ratings you can see that many people are opting for Volley. So, why not you became a part of this and sell and buy goods! Pros: easy to use online platform; buy and sell items; safe and secure; beneficial; convenient to use; fun and free to download.